Mathematics — from actuarial science to financial math — is about more than the theory of numbers. It discovers tools from which a quantitative understanding of our world is made possible. Moreover, the language of mathematics is truly a universal language, transcending ethnic, societal, and national boundaries. Finally, mathematics also is a critical filter, opening doors to exciting and high-paying careers in business, government, teaching and research. – Brittany Sullivan (B.A. ’12) — Read her story. Studying Mathematics develops skills such as arguing logically and rigorously, thinking abstractly, formulating and solving problems, analyzing data, and creating and analyzing mathematical models. Employers value these skills, and math majors are in demand in many different fields. Internships for Mathematics majors often are available in San Antonio at USAA (particularly in actuarial science) and Southwest Research Institute (in mathematics, statistics and mathematical programming). The National Security Agency in Washington, D.C., has a summer internship program in mathematical cryptologic problems for math majors.Other experiential opportunities include research programs at Louisiana State University, the Mathematical and Theoretical Biology Institute at Cornell University, the Alliance for Graduate Education and the Professoriate at Rice University, and the Summer Institute in Mathematics for Undergraduates at the University of Puerto Rico. The Society of Mathematicians is open to anyone interested in mathematics. The Society has sponsored speakers from all areas of mathematics, such as Mathematical Modeling of Environmental Systems, Brain Mapping Using Mathematics, Mathematical Applications in the Field of Hospital Management, the Group Structure of the “Magic Globe” Puzzle, the actuarial profession, and Geometric Methods in Population Dynamics.Past guests have included professionals from Brooks Air Force Base, University of Texas Health Science Center at San Antonio, USAA and Trinity University.The Society has also sponsors on-campus activities such as bake sales, Rock-Paper-Scissors Tournaments, Sudoku Tournaments and Poker Tournaments. 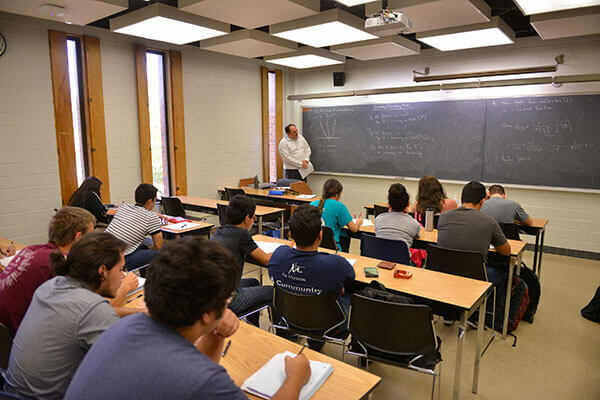 Participants often have the opportunity to attend conferences of the Texas Section of the Mathematical Association of America and compete in the Calculus Bowl against other Texas universities. In MATH Counts, St. Mary’s professors and students engage middle school students in fun, challenging extracurricular math programs that will broaden their view of academic and professional opportunities. Lean more about MATH Counts. The Math Scholarship Competition draws the best and brightest high school seniors from San Antonio and surrounding areas to compete for $100,000 in four-year scholarships to St. Mary’s University. For more information, contact Paul Uhlig, Ph.D..